We partner with the ClosApp application. This App tracks for you, automatically, the best people around you who could be a potential business or artistic partner. 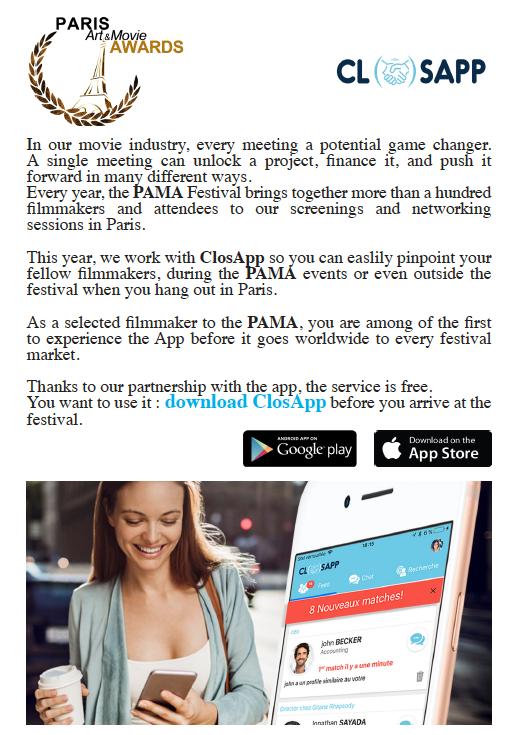 ClosApp sends you a notification when someone within 500 meters around you matches who you are looking for in the entertainment business ! Your pro-match also receives a notification : you just have to get in touch and meet. Download the App now : Google Play and Apple Store. Import your Linkedin profile or Set Up your profile. The more details about you as an artist, your skills, the better the App will match you with others. Affiliate yourself with the “PAMA – Paris Art and Movie Awards” event. – Use the App during the networking events. – Stick with the App later as it will be part of the Alumni network. – Privacy is 100% respected : our email is not share, the App includes a secure messaging system.